THIS IS THE MAIN SALMON. The Main Salmon River is a place of wonder - a ribbon of clear, blue-green water flowing through the 2.3 million acre Frank Church River of No Return Wilderness Area - one of the largest, most pristine, and untouched areas in the lower 48. 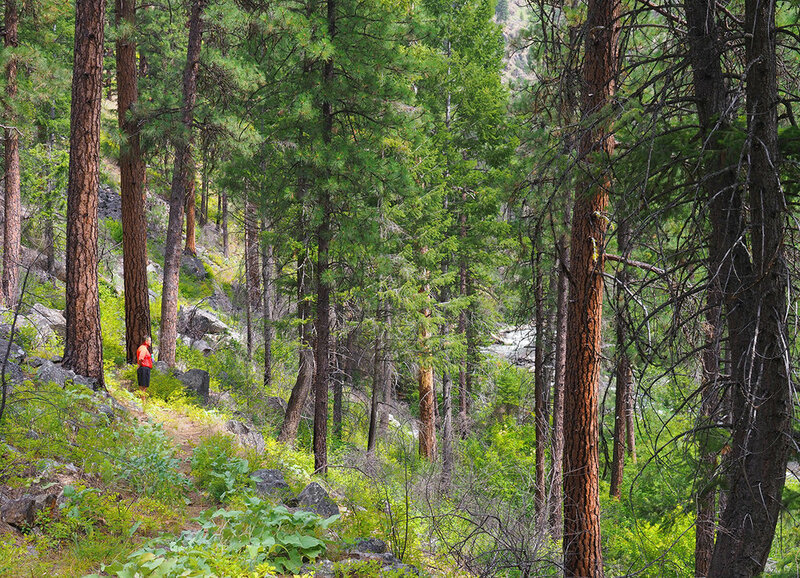 Off the water, the Main Salmon River offers an incredible combination of huge sand beaches, old-growth ponderosa pine forests, historic homesteads, miner’s cabins and ranches, rejuvenating hot springs, Shoshone Sheepeater and Nez Pierce Native American pictographs, and abundant wildlife. The water is warm and the rapids vary from fun-on-a-SUP-board to hang-on-tight-in-a-gear-boat. While its’ earliest explorers nicknamed this place the “River of No Return” (due to their practice of turning the wooden boats they used to explore the canyon into rudimentary cabins at the end of their arduous journey), we’re certain that your first expedition on the Main Salmon will make you want to come back time and time again! Day 1. Travel day. Meet at Denver International Airport 2 hours prior to flight departure for our flight to Boise, ID. In Boise, we’ll collect our gear and head to the tarmac for small-plane flights to Salmon, ID. This beautiful flight travels over the rugged mountain ranges of southern Idaho and takes us to Salmon, where ground transportation will drive us from the airfield toward the main downtown area. Our campsite for the night is just about a 15-miute walk from town, so following an afternoon swim in the Salmon River and getting situated in camp, we’ll walk in together for dinner. 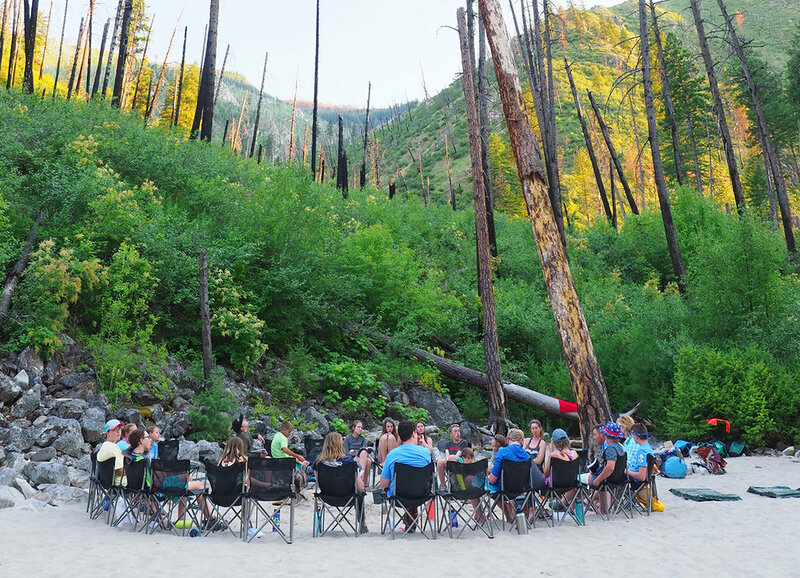 After we eat, we’ll return to camp for a brief orientation with the rest of our professional guide team, then begin exploring the GOALS curriculum before drifting off to sleep with the sounds of a crackling campfire and rolling river filling the star-filled Idaho air. Day 2. Fun rapids en route to Lantz Bar. Today, we’ll wake up excited to being our downstream journey. Before we can do this, we’ll need to drive about 1.5 hours from camp to our put-in at the Corn Creek boat ramp. Here, we’ll re-connect with our guide team, who has been here for a few hours rigging our boats and preparing gear and food for the expedition. By late-morning, we will load into boats and push off into the current - headed for our first raids in Killum and Gunbarrel. We’ll make lunch on a sandy beach next to the river, then continue on with our afternoon through more splashy, fun, rapids before making home for the night on one of the Main Salmon’s soccer-field size sand beaches - watching the greens light up on shore and the blues of the river take on a new hue in the evening light. Some nights on the Main Salmon, our campsite will be assigned by the rangers - and others we’ll get to choose. Generally, we’ll aim to camp somewhere near Lantz Bar tonight (just past Ranier Rapids on the map provided). We’ll take a short hike to explore the old cabin and home site of Frank Lantz, a Salmon River legend - before today’s kitchen crew helps to prepare tonight’s delicious dinner. A great reflective discussion around our first river campfire will help us sink into this place and realize how fortunate we are to have 5 more days exploring the Main Salmon! Day 3. Ancient messages and Barth hot springs! Our second day on the Salmon is packed with fun - navigating Devil’s Teeth Rapid, Salmon Falls, and Black Canyon Rapid. There are also off-river highlights today - at Devil’s Toe pictograph site and Barth Hot Springs. 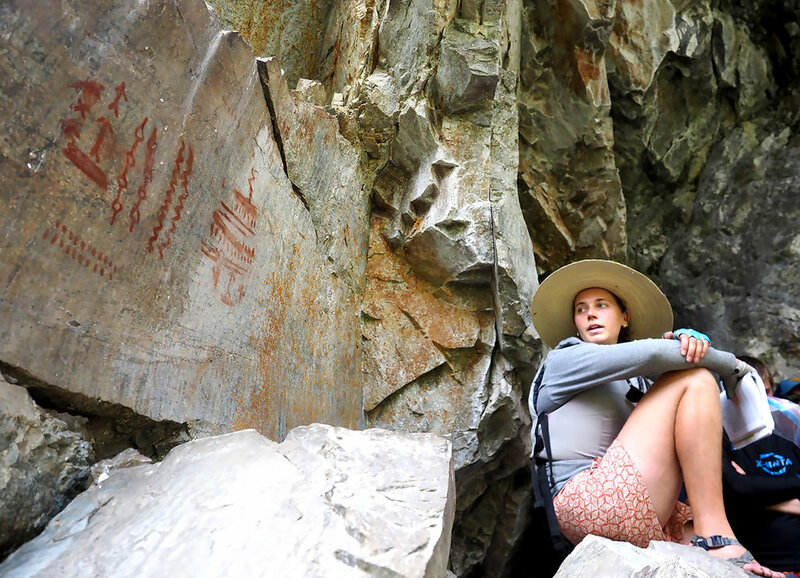 Pulling over at Devil’s Toe, we’ll take a short walk and learn about the Nez Perce and Sheepeater tribes who lived in this area, then try to interpret their ancient message painted on the canyon wall. Later in the day, another stop will lead us to Barth Hot Springs - a large tub fed by the hot geothermal underground spring that creates a very unique riverside hot springs. Assuming that our camp is at or near Bruin Bar, we won’t be too far downstream from Barth and can spend some time soaking in the hot springs, then float down to tonight’s camp feeling rested, relaxed, and further connected to this magical place. Of course, this decreased pulse rate won’t last too long - we’ve got some of the canyon’s best whitewater on deck for tomorrow! Day 4. Rapids to scout and Campbell’s Ferry to explore. Day 3 on the river offers up a string of class III and IV rapids - some of which we’ll pull over and scout together to identify the best line to run. Bailey, Split Rock, Big Mallard, and Elkhorn all present unique challenges as the river twists and turns it’s way past significant rock formations, and we’ll work on learning to read currents from scout trails today that will help us learn to work with - rather than against - the river as we overcome the challenges we’re being presented. Full of pride after getting through these rapids, we’ll explore Campbell’s Ferry this afternoon - learning about the colorful history that those who have called it home have created. We’re fortunate to be guided through this history by Doug and Phyllis Tims - the current caretakers and authors of Merciless Eden, a book they’ve written to forever preserve the stories that this place holds. Tonight’s camp isn’t far from Campbell’s Ferry - and our evening discussions will likely dive deeper into what we’ve just learned from Phyllis - giving us an even greater sense of the people and events that have made this incredible canyon what it is today. Day 5. Buckskin Bill’s. Today, we learn about when one of the interesting and intriguing historic figures not just in this river canyon, but in any canyon anywhere. After navigating Whiplash Rapid this morning, we’ll spend some time visiting Buckskin Bill’s historic home site. Buckskin was an incredible character, and the place he called home on the banks of the Salmon River has been converted into a “museum” that tells his story. We’ll learn about Buckskin’s larger-than-life personality, quirky habits and traits, and study the relics he left behind - then may even enjoy a game of sand volleyball on the beach outside his museum. Later today, we’ll hike to a unique grove of trees known by the Native Americans to possess healing qualities, and will carry on to our campsite for the evening just about the confluence of the South Fork and the Main Salmon - on the docket to explore tomorrow! Day 6. The South Fork confluence. Today, the canyon opens up before we reach the confluence of the Main and South Forks of the Salmon. We’ll take some time to explore the South Fork - admiring it’s crystal clear water and enjoying lunch at a great spot for the most adventurous in our group to giggle their way through some cliff jumps. After lunch, we’ll float through “Salmon Lake” - a stunningly beautiful section of river characterized by calm waters that reflect the towering canyon walls that are growing above us once more as we leave the confluence. Depending on the group’s energy and mood, this is a great section for silent floats or for some playful “pirating” on SUP boards and duckies. A lack of rapids does not mean a lack of fun - and many point to Salmon Lake as one of their favorite sections on the Main Salmon. Camp tonight will be in one of the most scenic and inspiring parts of the Salmon River - the perfect setting for a GOALS tradition of the last night’s solo and letter of gratitude to the canyon. Day 7. A few more rapids, then off to McCall. 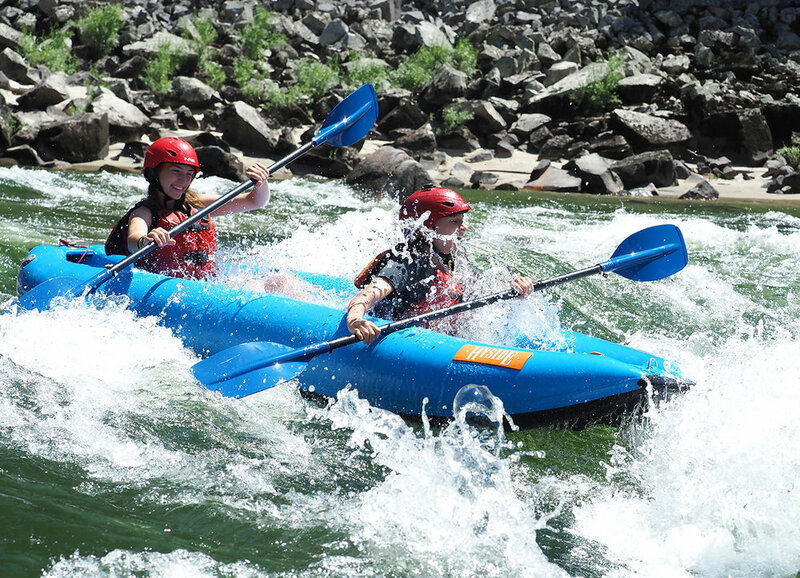 Today is our final day in the canyon, but it’s one that ends with some whitewater excitement! After navigating the last few rapids on the Main Salmon, we’ll come to the end of our river journey at Carey Creek boat ramp. Here, we’ll say good-bye to our river guides and help them load rafts and gear onto trailers before loading into our pre-arranged ground transportation headed for McCall. McCall, Idaho is a beautiful tourist town centered around Payette Lake - a clear, glacier-fed lake that we’ll enjoy swimming in this afternoon before dinner in town and camping one last night together. This makes the transition from “river life” back to our norms a bit more bear-able, and allows valuable discussions that help the group incorporate the lessons and lifestyles we’ve come to appreciate on the Main Salmon into the lives we live everyday. Day 8. Back to Denver. This morning, we’ll enjoy coffee and breakfast in McCall - then board ground transportation headed for Boise. As a group, we’ll fly from Boise to Denver - generally arriving some time in the early evening. GOALS all-inclusive rates go beyond the unrivaled on-river experience centered in our growth-focused curriculum delivered by trained leaders. They also include all transportation (ground and air) and all meals both on the river and on the road during our travel to/from the canyon. Additional inclusions (gear, government fees, supplies, etc.) are detailed below. R/T airfare from Denver, CO to Boise, ID. Scenic flight from Boise to Salmon, Idaho. Ground transportation from Salmon, Idaho to our campsite on night 1 and from our campsite to the put-in at Corn Creek (approx 2 hours) the following morning. Campsite in Salmon, Idaho the night before our launch. 81 miles of rafting, inflatable kayaking, and SUPing through the breath-taking Salmon River canyon – the second deepest gorge in North America. All launch fees and government use fees for the Main Salmon River. Camping in McCall the night after our expedition. Ground transportation back to Boise, Idaho and a return flight to Denver at the conclusion of your trip.